Located just steps away from the campus of the U.S. Food and Drug Administration (the gateway to the US health market) and squarely in the middle of the thriving Washington-Baltimore corridor, Viva White Oak is ideally positioned to become one of the world’s next great hubs for research and discovery, and a great place to reside or do business in a walkable, mixed-use, 21st century community. 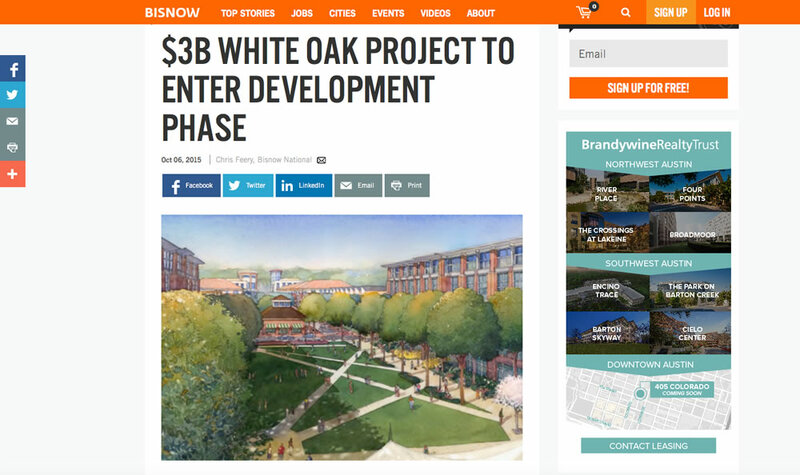 Currently, the 300-acre Viva White Oak community is planning for approximately seven-million-square-feet of commercial development and 5,000 residential units. Viva White Oak is being jointly developed as a public-private partnership between Global LifeSci Development Corporation (an affiliate of Percontee, Inc.) and Montgomery County, Maryland. It is our intention that great neighborhoods and a great village will be the definitive piece in attracting the best and brightest minds to this location. Great housing and great amenities such as fine dining restaurants, theaters and clubs, shopping at national or local stores, and acres of open and recreational space, directly linked to the academic campus, the adjacent hotel, and concentrated blocks of office and research, development and lab buildings, will make this a World Class life sciences center. In addition to its close proximity to FDA headquarters, Viva White Oak is also adjacent to the planned future site of the relocated Washington Adventist Hospital. The community will have alliances with major local, state, national and international research universities and institutions to collaborate on academic and lab research efforts. – Hosting of quarterly community input meetings with representatives of the surrounding communities such as the Calverton Citizens Association, Washington Adventist Hospital, East County Citizens Advisory Board, Maryland Farms Condominiums, Hillandale Citizens Association, and LabQuest. The purpose of these community input meetings is to keep the communities informed of progress, and give the communities a voice in shaping what Viva White Oak will look like. 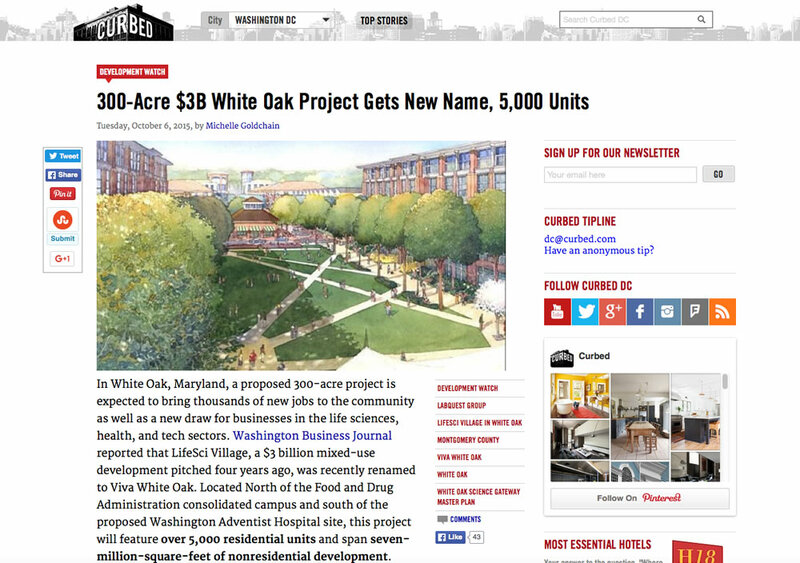 – Presentations to numerous community groups and civic associations showcasing the Viva White Oak concept, in comparison to what is allowed by right (i.e., a 9AM to 5PM office park). Surveys filled out by the audiences at these meetings, show they are overwhelmingly (94%) in favor of the Viva White Oak concept. Montgomery County announces Percontee as builder of $3 billion science center in Montgomery County. County Executive Ike Leggett and Jonathan Genn, President, The IV2 Alliance, Inc. and EVP and General Counsel, Global LIfeSci Development Corporation, announce the public-private partnership. – Global LifeSci Corporation signs IV2 agreement with leading higher education institutions for research collaboration. 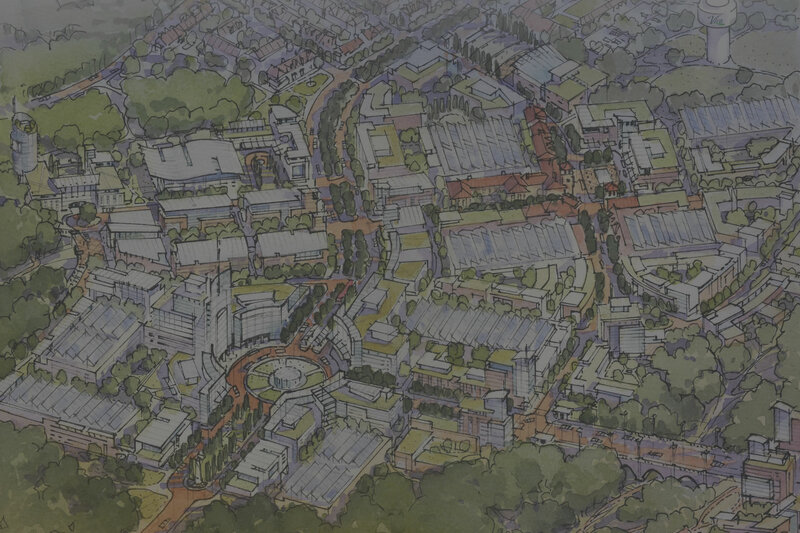 – Montgomery County Council approves White Oak Science Gateway Master Plan, paving the way for the project to move forward. 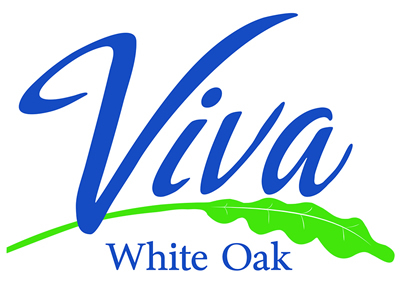 – The community (previously known as LifeSci Village for planning purposes) is officially named Viva White Oak. – Global LifeSci Development Corporation and Montgomery County finalize General Development Agreement. – International health collaboration agreement signed between The IV2 Alliance, Inc. and Telangana, India to advance global health at Viva White Oak.